Music — jazz, gospel, folk, and bluegrass — makes up the lifeblood of New Orleans’ most distinct and significant cultural traditions. The music provides a soulful perspective into the plight and passions of New Orleans’ historical communities. Women, especially, have embodied the creative tapestry which has contributed to the Dixieland Jazz, folk, Delta blues, funk and more. March marks Women’s History Month and to recognize the talent, history, and creativity that has compounded the rich arts scene of New Orleans, we’re listing some of the most influential female musicians and singers to come out of the Big Easy. A self-taught jazz pianist and performer, Sweet Emma Barrett was known for working with the Original Tuxedo Orchestra between 1923 and 1936. During her career, she worked with notable musicians such as Armand Piron, Sidney Desvigne, and the Preservation Hall Jazz Band. In 1947, her job at the Happy Landing Club helped to solidify her career further. However, it was the 1961 recording of her album New Orleans: The Living Legends Series that propelled her to great recognition. Although a heavily instrumental album, it was her first vocal performance. Nicknamed “Bell Gal” because she often wore a red skull cap and garter with bells that jingled along with her music, Sweet Emma Barrett covered Glamour and the subject of articles in publications throughout the United States and Europe. Despite her popularity, Sweet Emma was most comfortable performing in her native New Orleans, especially in the famed French Quarter. Those who are new to her music can find a good sampling of early 1960s New Orleans jazz on the album The Bell Gal and Her Dixieland Boys Music. The set is one of the few recorded of her with what would later be called the original members of the Preservation Hall Jazz Band (except for Robinson and Sayles). In 1965, her vocals and piano playing were featured with the jazz band in the film The Cincinnati Kid. Born in Faubourg Marigny, Lizzie Miles became known as a prominent Creole blues singer. Working with prominent artists like Kid Ory, A.J. Piron, and Joe Oliver from 1909-1911, she later toured the South where she performed in theaters and circuses. Highlights of her career include her performances with Manuel Manetta in Chicago and Charlie Elgar and Freddie Keppard in 1921. The next year, she produced her first phonographic recordings in New York. Although they were blues songs, she did not like to be referred to as a blues singer since her style was eclectic and varied. She toured throughout Europe and created lavish rococo-style numbers. As the leader of a trio, she recorded with Oliver and the esteemed Jelly Roll Morton. Later in her career, before retiring, she recorded several Dixieland and traditional jazz band songs and appeared at the 1958 Monterey Jazz Festival, amongst regular radio broadcasts. The esteemed New Orleans jazz clarinetist, performing Dixieland and Trad jazz, is considered a cultural ambassador for the city and traditional music of the city. Ketchens has performed throughout concert hall and festival in the city, and from U.S. Embassies to her weekly performance in the Royal Street Performing Arts Zone. She has performed for four U.S. president and today is one of the first and few female bandleaders in the city. As one of the most influential performers in the city’s history, she has garnered the name “Lady Louis” because of her ability to hit powerful high notes and her performance style which mirrors that of Louis Armstrong. She has performed with talents like Ellis Marsalis, Trombone Shorty, The Black Crows, and opened for Macy Grey and Dr. John. Her performances have been watched by million of people online. Today, she performs at festivals, fairs, and showcases throughout the world. Ketchens has also been featured in documentaries about New Orleans, it’s musical heritage, and even in shows like HBO’s Treme. In addition, her iconic performance stance — her head thrown back with her clarinet in the air — has been adapted into hundreds of pieces of art and thousands of photos to represent the musical spirit of New Orleans. You can find art inspired in her image at the New Orleans Jazz and Heritage Foundation and many sites and installations throughout the city. The famed New Orleans gospel singer has performed with masters like Duke Ellington and Thomas A. Dorsey. Influential for her contralto voice, as well as her Civil Rights activism, she sang at the 1964 March on Washington at the behest of Dr. Martin Luther King Jr. She was once described by Harry Belafonte as “the single most powerful black woman in the United States”. Recording over 30 albums throughout her career with her 45 rpm “gold” records sold millions. 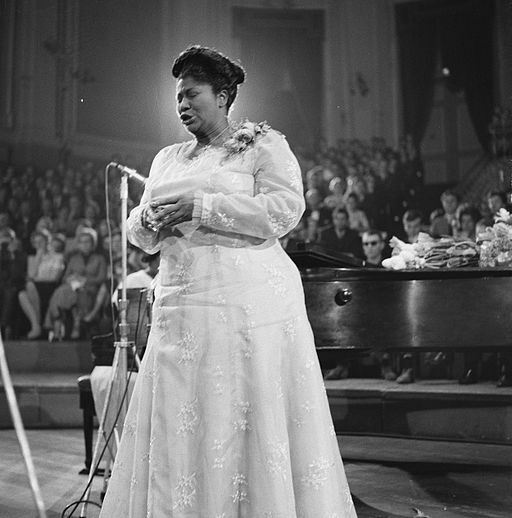 Singing since her teenage years, Mahalia Jackson has a career that spans decades. Her 1948 song, “Move on Up a Little Higher” skyrocketed her to fame in the United States, so much that stores could not stock enough copies to meet the demands of customers. It sold an astounding eight million copies. It was later honored with a Grammy Hall of Fame Award in 1998. Touring frequently, she performed more in concert halls than churches and, as a result, expanded her arrangements to piano and organ for orchestral accompaniment. Among her many famous recordings, “Let the Power of the Holy Ghost Fall on Me”, “Amazing Grace” and “Go Tell It on the Mountain” remain popular influences, among many others. In the 1950s, she became the first gospel singer to perform at Carnegie Hall. As she toured throughout Europe in 1952, she became known by critics as “the world’s greatest gospel singer”. In the late 1950s she performed in films like St. Louis Blue sand Imitation of Life. Respected and adored throughout her life, she also created the Mahalia Jackson Scholarship Foundation and dedicated her life to helping others. Jackson has received several honors and recognitions for her work. In fact, the National Academy of Recording Arts & Sciences created the Gospel Music or Other Religious Recording category for Jackson and she became the first gospel artist to win the Grammy Award. She was later inducted into The Louisiana Music Hall of Fame and a laureate of the Lincoln Academy of Illinois, being awarded the Order of the Lincoln for performing arts. In New Orleans, the Mahalia Jackson Theater of the Performing Arts has been dedicated to her since December 2008. Nicknamed the Soul Queen of New Orleans, Irma Thomas has enchanted listeners with her evocative voice for decades. Thomas has made a successful career spanning over 50 years. She got her start after singing with bandleader Tommy Ridgley. Later, she worked with famed songwriter and producer Allen Toussaint on her hit singles like “It’s Raining” and “Ruler of My Heart”. One of her biggest national hits include “Wish Someone Would Care” and “Breakaway” and “Anyone Who Knows What Love Is”. Her first four Imperial Record singles all charted on Billboard’s Pop Chart. Although, her later recordings were less successful, she has remained a significant singer in both New Orleans and American music. She still performs at New Orleans Jazz & Heritage Festival each year and was later inducted into The Louisiana Music Hall of Fame for her contributions to the city’s music scene. In 2007, Thomas won her first Grammy Award for Best Contemporary Blues Album for After the Rain and has been nominated for others. These impressive and significant female performers have helped to make New Orleans a critical addition to the varied American music scene. Their talents and creativity have helped to generations of performers after them while offering insight into the culture and perspectives of the Big Easy’s way of life.